The support that being part of a community offers is really valuable. 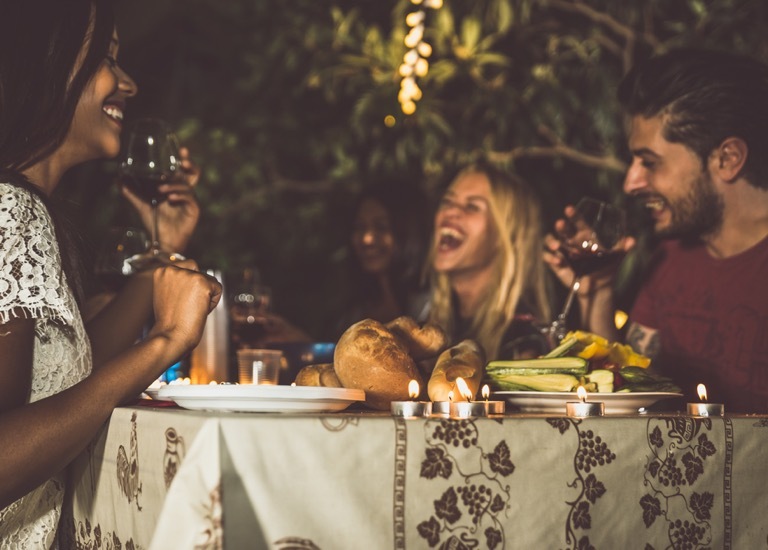 For single people in particular, having a bunch of friends and acquaintances to hang out with brings a rich variety of experiences and social opportunities. Instigating and arranging group days/nights out can also be a great way to network and get to know other singles, but lots of trips to cinemas, restaurants and cafes can become expensive. So here are some tips and ideas to help you plan inclusive, fun (and wallet-friendly) activities. Breaking bread together is a pillar of community building and there are loads of ways to spice it up, literally and metaphorically! Popular take-out options like sushi, are pricey and it can seem daunting to try and replicate the experience at home, but with a few stock items, it’s relatively inexpensive, easy and delicious. A bit like an edible arts and crafts session, getting together with a selection of ingredients to roll your own sushi, is an entertaining way to bond. Similarly, you could arrange some burrito or taco making, where everyone attempts the most unusual fillings and even raise the stakes by getting everyone to vote for the best one. Inviting a bunch of people over who will all bring some interesting wine or an unusual cheese, makes for a varied and effortless tasting evening and encourages everyone to try things they wouldn’t normally buy or order in a restaurant. Ping pong has had a resurgence in the past few years, providing a bit of physical activity with a wide range of appeal. All you need is a basic table tennis set, a reasonably sized kitchen table and as many or as few people as can make it. So too have 8-bit arcade style games, old school Nintendos and Sega Mega Drives – throw in some penny sweets and fizzy pop and you have yourselves a retro youth club night! If you’d like to multi-task your socialising with some money saving or making, clothes swapping or “swishing” benefits everyone. It can be arranged as a charity event, charging a few pounds entry to raise money for a particular cause while giving your friends a chance to offload things they no longer want and browse for things they do. Add in some cake or cocktails and this can be a great way to get to know new people (the caveat to this being, that it tends to appeal more to women, although extending it to a “stuff” swap can make it more inclusive). Or consider getting together to car boot items or arrange group charity shop hauls and treasure hunts. Whether you like to organise your own events, or you’d rather connect with others who are already doing so, check out Single Friendly Church. This is an invaluable way to reach out to other single Christians who are not already part of your network or community. It can seem daunting starting a meetup group or planning activities, so Single Friendly Church offers really helpful, practical articles, advice and information on how to do it. If you’re new to an area/singleness/Christianity, or simply want to find out what’s already happening in your area, check out the section: Find a Local Group. You can also promote and look for events happening near you on Christian Connection’s Discussion Board section: Out and About. The opportunities are out there and resources such as these are making it easier all the time to have a great social life, build meaningful friendships and potentially meet your future spouse along the way.